Bullet development has been under way for the .460 S&W, the latest .45 caliber, hand-slapping monster pistol cartridge. That's a very good thing for muzzleloaders, as these bullets are designed for the same velocities that today's better inlines can produce. 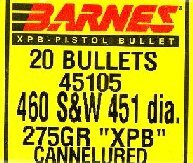 Brand new and just on the market is the Barnes part #45105, .460 S&W .451" diameter, 275 grain "XPB" Triple Shock bullet. It sounded like an excellent muzzleloading bullet, and when I received them they looked like excellent muzzleloading bullets. But looks can be deceiving, and when it comes to guessing how well a bullet will group I'm wrong more often then not. I attribute this to my legendary lack of psychokinetic ability. There has never been any substitute for actually pulling the trigger. The reasons for considering this 275 grain bullet are many: the potential for 100% weight retention and deep penetration afforded by Barnes all copper X-Bullets, the more aerodynamic ogive found on this bullet compared to most blunt JHP pistol bullets, and the beautifully formed flat base that is easier on a sabot than concave or boat-tail bases. With a conservatively estimated real-world ballistic coefficient of .220, it is a better flyer than most of the 250 grain class .45 caliber bullets, yet promises less recoil than shooting a 300 grain bullet at similar velocity. It was a 52 degree day in the field today with gusty winds from 8 to 17 mph according to my Kestrel wind meter. Not exactly the best range conditions. But, I was anxious to try this new bullet out to see if the accuracy potential was there out of a muzzleloader, and I'm pleased to report that it is. The first twenty shots all landed within a two inch square, despite the wind gusts. This was one of the better groups of the day, using 60 grains of Vihtavuori N120. The Barnes 275 grain XPB loaded easily in my Savage 10ML-II, engraving the sabot on the way down with little force and no slop. Despite the 2300 fps plus velocity, it was surprisingly comfortable to shoot, much more so than a 300 grainer at similar speeds. Ballistically, using an 8" kill zone, the 60 grain N120 load has a maximum point blank range of 237 yards using the .220 BC, and retains 1416 fps and 1225 fpe at 290 yards. According to Barnes engineers, this bullet will have the minimum 45 degree petal opening (expansion) at 1400 fps and above. 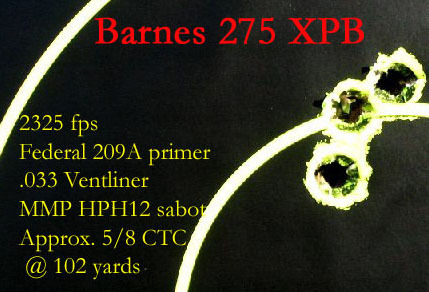 The XPB 275 joins the 300 grain Barnes MZ-Expander and the .458 Barnes Original as a superbly accurate bullet out of the Savage 10ML-II. More work needs to be done, so I'll report on 200 and 300 yard accuracy, other loads, and chrono-to-chrono ballistic coefficients as time and range conditions permit. To say the precise name of this bullet is quite a mouthful, so I'll just let a picture tell the story. It is an impressive bullet from Barnes. Copyright 2005, 2013 by Randy Wakeman and/or chuckhawks.com. All rights reserved.